How do you make a good bike even better? Carefully source a bunch of good gear, and bolt 'em on, that's how! Wow! I've always liked BMW's R1100 S, a good all-round roadbike, but the "Special" I've just spent some quality time on is something else again - head and shoulders above the stock machine. That's because the fitment of a variety of aftermarket goodies, all of which complenent each other, has given this bike a new lease of life - and a hell of a lot more bite! Originally strating life as a bog stock 1999-model R1100 S, the bike was tweaked by Brad Black, a mechanic at the Oakleigh-based (Vic) BMW dealership Moto One. The list of add-ons (see panel) is a lengthy - not to mention expensive - one, but once aboard I had no doubt the effort and money was well spent. It was very difficult to hand it back to its owner! The engine mods are quite effective, without detracting from the boxer engine's famed tractability - there's just more power whenever it's needed. A rider can easily pedal along in "lazy" mode, or get up it for the rent; either way the impressive FIM Ultimap eprom fuel-injection does the job without complaint, delivering a smooth, grunty surge of boxer power. This all occurs with a unique backdrop of sound emanating from the Staintune exhaust system, certainly louder than the standard exhaust, but not offensively so.The Staintunes also contribute to the crisp, clean throttle response, no matter what the tacho needle's indicating. Having said that, the engine is at its best in the midrange, where a large chunk of torque effortlessly shunts the R1100 S up to speed. This engine is so easy to use, your grandmother could ride it! It feels that way, anyway, until a glance at the speedo reveals the truth - this bike is deceptively quick! I surprised myself a couple of times, until I grew accustomed to how quickly the speedo needle arcs around the dial. The brakes, too, have come in for some attention, and are simply magnificent! Despite the brakes on Black's bike being '99 vintage, with smaller discs and different calipers, they stop the 225-plus kilogram bike with ease and precision. Combined with the Telelever front end, the bike simply stops when the lever is squeezed hard, with none of the instability, shimmy or shake a traditional front-end can put the rider through as its wheelbase shortens under the compression of braking. While the EBC HH pads did squeal a bit, I hardly noticed when braking hard - I was too busy praying my retinas weren't detaching! A major reason for the high-level braking performance has to be attributed to the suspension mods - for me the stand-out addition in an impressive list of bolt-on trickery. The front Ohlins shock, in particular, separates this bike from the standard fare. The new addition ensures that weight transfer under brakes is superb, allowing the bike to eat up bumps with ease. When I initially sat aboard the bike, the suspension felt on the soft side of plush to me, and in one respect I was right - but not in a negative way. The suspension is plush, but beautifully controlled at the same time, with nary a hint of harshness passed through to the rider except for the gnarliest of road zits. I found myself lining up pot holes and road depressions, both in a straight line and cranked over, just so I could marvel at the sheer control and composure of the golden suspenders - again working well with the BMW Telelever/Paralever set-up. The front shock is only adjustable for rebound and preload, but feels spot-on as it is. The rear is fully-adjustable. It is real "magic carpet" stuff, and inspires the sort of confidence that meant I could get on with enjoying the ride. The bike's tyres, Michelin Pilot Sports in 120/70 (front) and 170/60 (rear) fitments, performed without fuss, and certainly added to the extra grip available over the standard bike. I was so impressed, I had to take a friend along for a ride. I merely cranked up the remote adjustable preload to suit the extra weight, and off we went. Despite the extra weight (I might just add here, for my own safety, that there wasn't much extra weight!) the bike remained nimble and compliant, even though the centrestand did touch down a lot easier. Speaking of which, the centrestand was even simpler to use thanks to the ride height being a little taller unloaded - normality resumed with me on board. Black also saw fit to add various cosmetic enhancements, which have some practical benefits as well. The Boxer Performance front screen retained the stock screen's ability to effectively deflect wind from the rider, while the same company's carbon-fibre front guard goes some way to helping protect the engine from the road grime that can find its way past the OEM item. 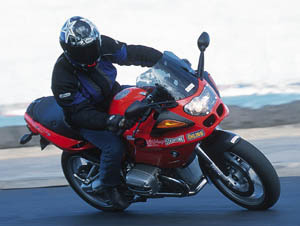 The bike averaged 14.5km/lt in the time I had it, around 1km/lt thirstier than the standard AMCN test bike in 1999 - hardly a large price to pay for the increase in power the bike provides. I really enjoyed my brief time (too brief) aboard the up-specced R1100 S; it just goes to show how some thoughtfully chosen aftermarket add-ons can make a good bike even better - that's just what Brad has done. The cost of all the add-ons is substantial, but it is some of the best stuff money can buy - and it works. Reproduced with the kind permission of the folks at AMCN, from Vol 51, Issue 20. Recommended retail prices, in Australian Dollars, for all added pieces are as follows, and include GST.